I figured today I would do an "ecosystem" blog, since those seem to go over really well. It's not often that I can talk about a whole bunch of plants and how they interact together, since I'm not a true botanist (although, if this was back before 1969, I would be a botanist since fungi were considered part of the plant kingdom...but that's another story for another time). Learning about how plants interact with each other (and sometimes how insects interact with plants; this is coming sometime soon to a blog post near you!) often takes a lot of research, and since I've got enough of my own to do lately with writing a thesis, I've got to keep my priorities straight. But this is an ecosystem I know quite a bit about, since I live there: my back yard. I just took a picture of a tiny piece of my back yard, and figured we would start in one area of the photo and move through it and talk about each plant. So here we go! Pay attention to the numbers in pink to know what's what. Many of these plants I've blogged about before, so if you'd like to learn more about each plant you can click on embedded links that will take you to previous posts. 1. This is the evil periwinkle. We even have both species of periwinkle in our back yard: the "major" species and the "minor" species. If you learn one thing from me about gardening, let it be this: if you're newly landscaping a yard and starting fresh, don't EVER plant periwinkle. I've been trying to get rid of it for months, and every time I seem to make a dent it grows back twice as fast. That's because it actually thrives after being disturbed. As soon as you rip off a piece, the plant recognizes that it has been wounded and immediately shuttles resources to that area of the plant to repair itself and to regrow. Sneaky, sneaky plant. The only way to truly get rid of periwinkle? Burn it. Since I don't really want to set my back yard on fire, I guess I'll have to settle with ripping areas of it out every so often until I weaken it enough to kill it. Periwinkle, one day you're going down. Mark my words. You can read more about periwinkle and one specific species of it HERE. 2. 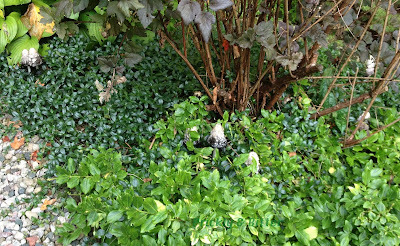 This is a shrub-like ground cover I haven't blogged about before. The species name of this plant is likely Euonymus fortunei, and I have no idea what horticultural variety it is. Like periwinkle, once planted it's darn near impossible to get rid of, and spreads like nobody's business. It doesn't grow very tall off the ground and looks rather boring, so if I had a choice it would be gone. 3. This shrub with maroon leaves is called ninebark. 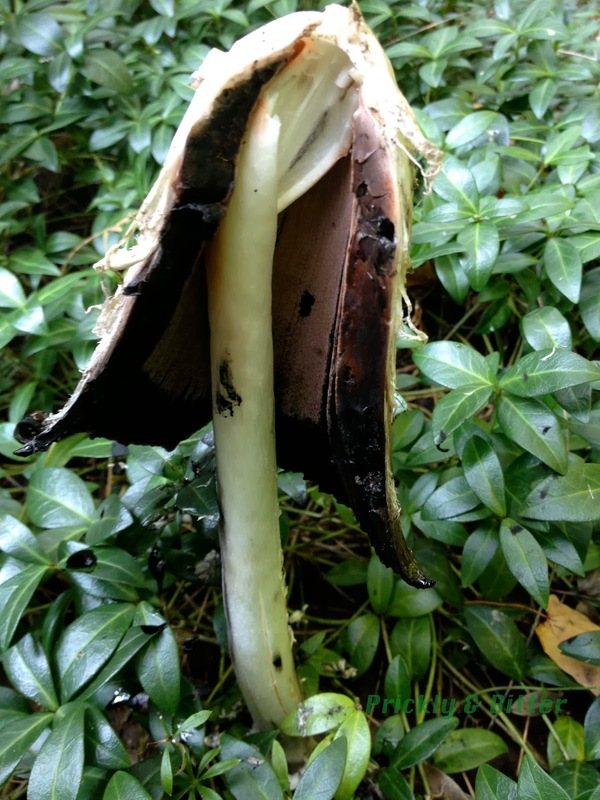 It's a great native species, and gets its common name from the way the bark peels off of the stem (it curls around, appearing as the number "9" when you look at it from the side). It's a relatively uncommon garden plant since it has a rather undesirable quality: it is quite susceptible to both powdery and downy mildew. The last thing you want is for all of your lovely maroon leaves to turn white and fluffy, but the best way to avoid this is not to water your garden using a sprinkler, but rather a soaker hose near the base of the plants. If moisture is on the leaves for a prolonged period, that's when problems arise. 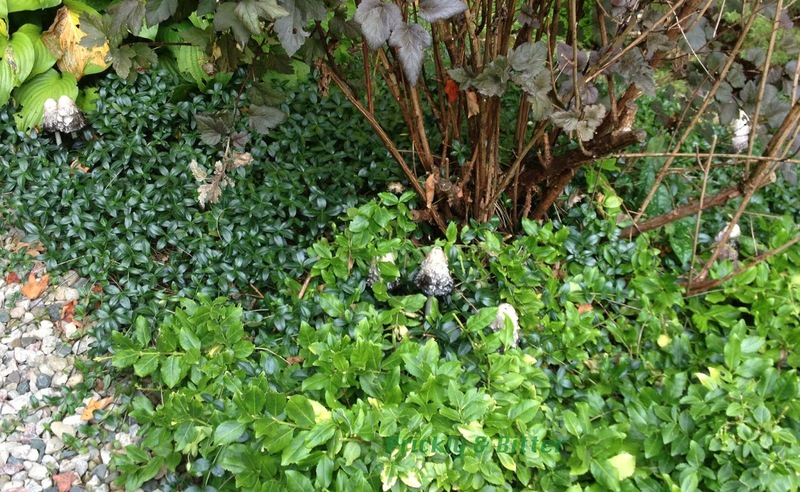 If the leaves stay as dry as possible, there's less of a chance of your ninebark being affected. There are some varieties on the market that are more resistant than others, so check which type you buy before you buy it. You can read more about ninebark HERE. 4. This is a hosta, as I'm sure many of you figured out on your own. Hostas are some of the most popular garden plants in North America, since they are so tolerant of many different environmental conditions, and they are so variable in their morphology depending on variety. We have some of the "blue" type of hosta (the leaves are a dark green and are covered in a very thick layer of wax which gives a blueish tinge to the leaves), variegated leaves with white edges and green interior (and the reverse on other plants), variegated leaves with dark green edges and light green interior (and the reverse on other plants), and plain green leaves. I personally find hostas boring. I think there are plenty of other native species that produce much more exciting flowers with better scents than hostas, and they're better for attracting pollinators of all types into the garden. That being said, they're not nearly as terrible as periwinkle, English ivy or Euonymus since they don't spread quickly and don't produce viable seeds (at least, not in Canada they don't). They do spread, and will take over an area if left unchecked so make sure you keep them confined to their space (especially if you live near an Environmentally Significant Area). You can read more about hostas HERE. 5. This is the trunk of our Dawn Redwood, one of my favourite trees. It is called a "living fossil" because it was known from fossilized remains long before it was discovered growing in China. It is still critically endangered in the wild, but population restoration efforts are underway to try to bring this tree back to its former glory (it was once abundant worldwide during the time of the dinosaurs). One of the best things about this tree is the texture of the wood; when the tree is alive and healthy the trunk is almost spongy on the outside. It's also fire-tolerant like many other species of redwood that actually require their seeds to be burned in order for them to germinate. Pretty cool! You can read more about Dawn Redwoods HERE. 6. This small shrub is a horticultural variety of white pine. It grows very slowly, but seems to be much more prone to disease than our white pine trees in our back yard. We used to have three of this type of shrub, but have had to replace one already because it was completely dead. This one has died on one side and has been subjected to some pretty brutal pruning; when shrubs or trees are so slow-growing, it's really bad for their health to prune half of the plant away, even if it's dead. What might look dead to you might not be considered dead to the shrub or tree, and it can often have disastrous consequences. Keep that in mind around this time of year, since the late fall and the early spring are the "seasons for pruning". Fast-growing species won't be bothered with pruning; before you know it you'll probably have a new branch taking up the old one's place. You can read more about white pine trees HERE. 7. This tree that you can barely distinguish in the picture is a European beech tree, and one that seems to be on its own schedule. This year is the "year of the beech mast," and so most beech trees produced an over-abundance of beech nuts in the prickly seed pods that is so characteristic of beech trees. But not this one! Not a single seed in sight. I always knew our beech was "special." :) While not the same tree, you can read all about European beech trees HERE. 8. 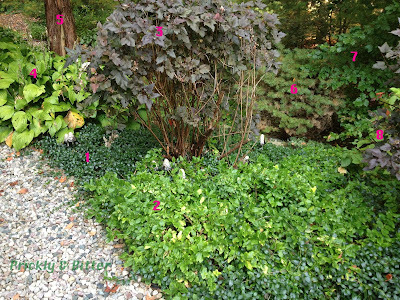 Even less visible in the photo is the shrub behind the ninebark on the far right, a dogwood. Not just any dogwood, either; it's a red osier or a red-stemmed dogwood. It produces these spectacular white berries in the fall if left untrimmed, and these can be a great food source for birds (depending on the bird, of course). They are a native species, and are popular garden plants because of their very attractive branches which remain bright red all winter. Again, not the same individual shrub, but you can read more about red-stemmed dogwoods HERE. So that's that! 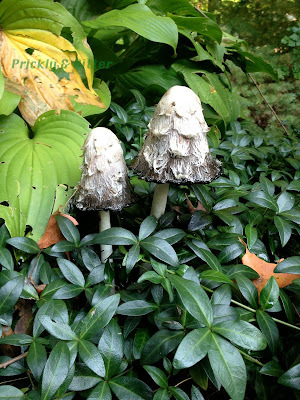 A blog about a tiny little piece of my back yard. Surprisingly, the hostas and ninebarks are tough enough to put up with the periwinkle trying to steal all of their resources, and while not out-competing the periwinkle they seem to be holding their ground. The Dawn Redwood has grown far more than you would expect since we moved in based on the normal growth rate of the tree, so we seem to be doing something right. While the white pine shrub is unhappy, it's been there since day one in the garden so it can't be THAT bad. I'm guessing the same thing killed its branch as killed our white pine tree that was just across the path from it, so it wouldn't surprise me if the whole shrub was dead in a couple of years (beetles. Evil bugs!). The dogwoods always grow to unmanageable sizes during the spring and summer, but the birds love them (we've had a cardinal nest in one of them for the last few years in a row, so they provide great shelter to birds). BUT WAIT. What if this entire blog was...a ruse? Hopefully the most observant amongst you noticed that this likely wasn't about those eight plants at all. Sure, it's nice to see eight different species in a tiny area of a backyard garden all working together. But actually...there are nine species there. And the ninth is by far the most exciting. Zooming in to the base of the ninebark might be helpful. What's that?! Why...mushrooms. The fall is "the season of the fungus" in many areas of the world because it gets so wet from fall rain storms, and the nights cool off which can stimulate some fungi to produce mushrooms. 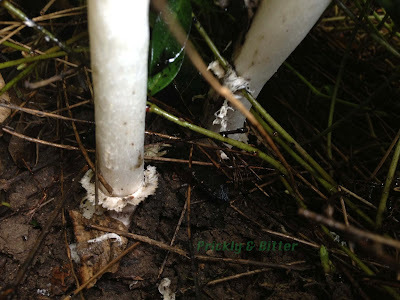 Shaggy manes are some of these fungi that require cool nights in order to produce mushrooms. This is why you find them most often in the spring and in the fall (and rarely during the summer since it is way too warm). Normally I try to reserve my fungus-related blog posts for Fridays, since that day is officially "Fungus Friday" to my field. But today is an extra-special day, at least to one area of the world. Today, October 13th, is National Fungus Day in the United Kingdom. How awesome is that?! A whole day dedicated to fungi and how awesome (and useful) they are. I think this is a great idea, and Canada really needs to get on this bandwagon. That's one of the unique things about the UK: they're much more in-tune with nature than we are in North America (generalizations; this obviously doesn't apply to everyone in either location), and take a much larger role with public education and why diversity for the sake of diversity is important. This is something that is starting to become more important in Canada, but industrialization of the country is quickly gaining ground on preservation of our natural areas. Whenever there's a significant area of land designated as "green space" (or even worse, "vacant land") it is increasingly likely to be snatched up by a developer, bulldozed, and some kind of new development (mall, apartment building, housing complex, etc.) put in. Having days like a "National Fungus Day" or a "National Tree Day" (or "Earth Day," as we have here in April) is a big step towards educating everyone about the value of diversity and why it needs to be maintained (or even augmented!) in urban areas. 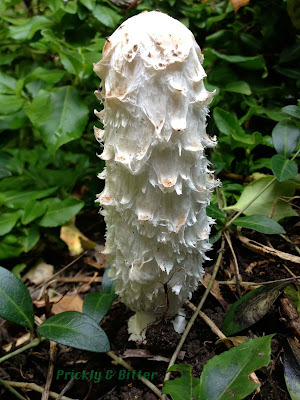 Now onto information about the shaggy mane! This mushroom carries special importance in my life, as I'm sure it does in many mycologists' lives (amateur or professional): this was the first fungus that I learned to identify by Latin name. 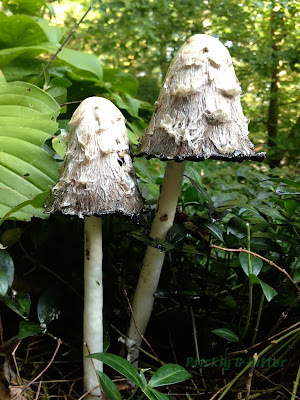 Shaggy manes will always be near and dear to my heart. It wasn't until a couple of years later (I learned the Latin name of this species in a plant diversity course in my second year of undergrad) in graduate school that I learned that these were edible and that their method of spore dispersal wasn't very special after all. But let's start at the beginning. As this mushroom develops, it starts off as a little white stub emerging out of the ground. It almost looks a bit like a shaggy egg. This egg will elongate, and eventually the top of mushroom, or the cap, will detach from the base, leaving a ring around the stem (the technical term for this is an annulus, but "ring" works just fine. You can see this in the 5th picture above). This ring is a very fragile piece of fungal tissue and often detaches with age, but if you manage to find an intact ring on the stem of a fungus make note of it (especially if you're trying to identify it later). Rings are sometimes the only way you can tell two species apart (one will have a ring, the other won't). 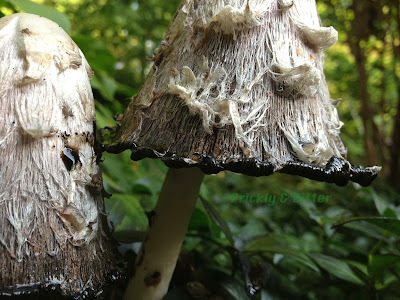 As the stem continues to elongate once the cap has detached from the ring, the gills develop on the inside of the cap. You can see them in the last picture where a squirrel has kindly separated one of these mushrooms in half so you have a clear view of the inside. The gills almost look "fuzzy", and that fine granulation are the spores being produced on the gills. The spores are a brown-black, so the gills get darker the more the spores mature. Here's where what I learned the first time and what I learned the second time about this mushroom's spore dispersal mechanisms conflicts. 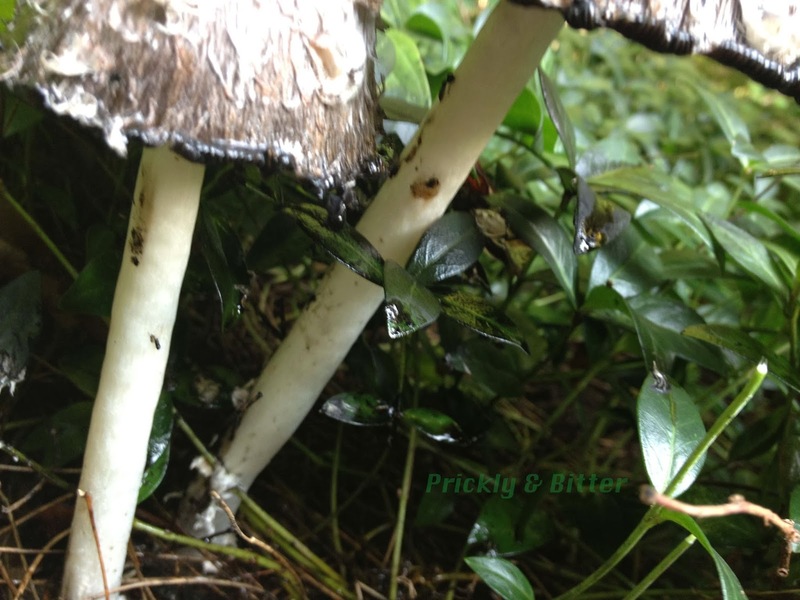 In the picture above you can see the bottom edge of the mushroom starting to curl outwards and turn black and goopy (more easily seen in the 3rd picture above). Originally it was thought that this was the way that the mushroom disperses its spores: the mushroom cap auto-digests, leaving this black liquid behind that contains huge masses of spores (you can see this black goo on some of the periwinkle leaves in the above photo). If you think about this idea, it should seem a bit illogical to you (hopefully it does!). The whole point of producing spores is to reproduce. The spores, like seeds produced in the higher plants, are the babies of the mushrooms. Two spores must come into contact (conjugate) in order to produce a new fungal individual (like egg meeting sperm). Like human children, the mushroom prefers if their children "go off and prosper" in the world. How would this happen if you're dripping your babies onto the ground directly underneath you? That would mean that your babies could only start growing directly under you, and because you're a very efficient fungus you've already used up all of the resources there are to use. This obviously isn't optimal for your children; they're being born into a world without food. And no parent wants their child to start off in the world that way (human or otherwise)! Some fungal scientists (mycologists) decided to test this idea by taking some of the black goop and spreading it on petri dishes with nutrient medium. If the goop contains spores, they should start growing. If the goop doesn't contain spores, nothing should happen. Guess what happened? Nothing. No growth, no nothing. The goop really is just the fungus digesting itself because it has no use anymore for the mushroom; they are very "expensive" energy-wise to produce and maintain, so if you don't need it anymore then they're a good thing to get rid of. This is one of the reasons why mushrooms are so short-lived. The bonus of this is that the black goop actually contains quite a few nutrients in it, so the fungus can use its former self as a new food source to keep spreading underground. Pretty crafty! So where do the spores go? They're produced on the gills like any normal fungus, and then they...blow away in the wind, like every other fungus (OK, almost every other fungus). Not a very exciting story after all! As I mentioned above, these mushrooms are edible, just pick them when they're young. The black goopy stuff isn't toxic, but is quite bitter compared to the rest of the mushroom because all of the sugar is being digested. As these mushrooms are cooked they will turn black and soupy (don't be alarmed; this is normal for this fungus when heated), so a lot of people (me included) are put off by their appearance. From what I hear from multiple sources, they are quite tasty. Maybe I'll finally break down and try them sometime. There has yet to be a single instance of the chemical coprine being isolated from this species (the active chemical in the drug Antabuse; it reacts with alcohol to induce projectile vomiting to try to dissuade alcoholics from drinking), but many people who report having sensitive stomachs may still react to this mushroom, especially when combined with alcohol. If your stomach is easily upset after eating unusual foods, I suggest you consider finding a different mushroom to eat for dinner. 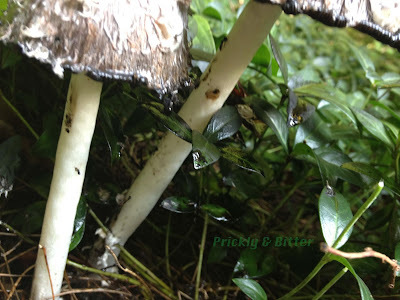 I hope you've enjoyed my "fake-real blog post combination" to celebrate this special day: National Fungus Day. The Royal Botanical Gardens Kew in London, England put together not only a fantastic day in their gardens and in their fungarium (a museum-like place full of dried fungal specimens) to help educate the public about fungi, but also a wonderful art installation throughout the gardens by world-famous sculptor Tom Hare. They have put together a short video about the art installation, and it contains a great narrative by the curator of the fungarium, Bryn Dentinger. It's a GREAT video, and definitely worth a watch! Kew has also put together a "behind the scenes" video of the Kew Fungarium that's also a great way to spend 5 minutes and 35 seconds of your time.